Recently, in a discussion forum on Facebook the planned redevelopment of Acton came up. It's on the site that I remember the 'Wall's' factory being. I don't recall ever visiting the 'Walls's Club' but also recall that there was one. New houses were built on that site, when Wall's went. This helped social needs and I knew some of the people who moved there, from the large estate in South Acton. Today there are plans for a larger scale housing project, including at least one 'tower', or tall building, alongside the railway lines. I'm not connected with this housing project. Far from it. It was assumed that I was part of Catalyst Housing, just because I acknowledge a seen need for more homes. It's important to understand needs from all angles, if just one view is considered then only one perspective is seen. I'm not an advocate of tower blocks but do read about regeneration projects sometimes, have an interest in architecture and have been a member of a housing pressure group in the long distant past (legal, temporary acquisition of blighted properties, for single and childless couples). A comment had been made about 'capitalists'. CAPITAL: If a housing development does not use capital, where does the money come from to pay for bricks, mortar, labour? All concerns are considered, but regarding things like shadows from buildings, there are standards that architects have to aspire to (in their training). This includes where shadows are cast. 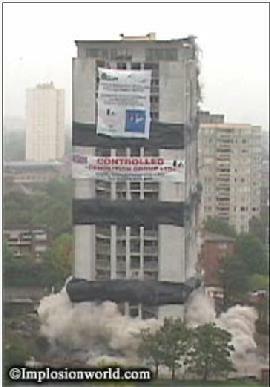 But saying this doesn't mean I approve of tower blocks. I'm just not prepared to agree with something (long shadows, or whatever) that ain't necessarily so. However, I do remember the shadow of Barrie House. It cut across the landscaped area beside it. In the hot Summer evenings it was a nice cool spot. Sitting in that shade was so much nicer than being stuck up on the 18th floor, with a young child and a broken down lift. BLOG ON ACTON was started with a 3-way connection. The first came via a Facebook group called 'We Love Acton', where some of the members were organising a fundraising stall. This led to a visit to Acton Market Christmas Fair, where group members gathered to run their tombolla. From here I was just across the road from my first visit to West 3 Gallery and was grateful for the reminder of it being there from my amateur photographer/artist friend, David Lawes. Whilst I don't live in Acton these days, I'm 15 minutes away by E3 bus or longer if walking on a direct route Eastwards. Easy enough to keep in touch and share good news. ART & CRAFTS are making their mark in Acton these days and certainly a sign of co-operation between community spirited creatives. This blog largely focuses on creativity, this is where my pen flows best! but there's sure to be a something interesting about the British town in West London that's named after an Oak tree! It's been a challenge to keep up with the goings-on in Acton so if you don't see a recent blog here, you can be sure that by following the links on this website you'll find much in the way of creative pursuit and arts education in Acton, Ealing, West London. The best thing to date, that I've seen in Acton, is the art gallery. Every month I'm being kept up to date with what's on at W3 Gallery. I've not been able to get along for a while, but the Acton Community Forum do a great job with communicating arts news for this part of the Ealing borough in West London. Click on the link below to find out what's on this month. A new community page for Actonians who live/d, work/ed in the part that's south of South Acton. It's actually a part of Chiswick ( north of North Chiswick, aka Grove Park), but when the political boundaries were re-arranged in some past time, this little part of Chiswick became a part of the London Borough of Ealing. I can't let this month go by without reminding you about West 3 Gallery. Every month the gallery offers an array of visual arts and more. It may be some time before I get back there, as family commitments and creative projects hold by my time and focus. But that doesn't stop you from appreciating art and the efforts put into artistic action. If you're far from Acton, it doesn't stop you from visiting the West 3 Gallery website to check out how many are making art of time. Be inspired to constructive creativity! So much has been going on in the town of Acton this year, especially in the W3 Gallery. Last month in the West 3 Gallery a youth art exhibition was held, entitled 'The Future We Want', where a mix of styles were shown. These included film, visual art and audio, with creative contributions from individuals and Ealing Youth and Connexions Service, Bollo Brook Youth Centre, Acton Vale Youth Club, The Living Room and W4 Youth. If you have photos of the event that you'd like to share here (and even something to say about the exhibition) do contact me via the number at the bottom of this page, or email me. Praise to Acton Arts, who not only make creative pursuits more widely available but also foster a sharing within communities. 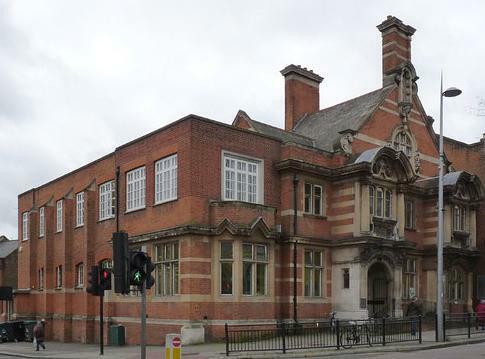 News about Acton library moving into the old Town Hall came with no suprise, in a time when money seems to have gone 'out of fashion' the sharing of idea is certainly evident. I love the idea of the now vacant building, that once housed thousands of books for loan, becoming an arts centre. To keep up with news on this, or to offer your support please click on the photo image of Acton library below. I came across a poem I began writing in 1983, it was about my first encounter with a tower block in South Acton, called Barrie House. The block was still being built when I saw it, in fat I didn't know what it was when I first set eyes on it. Little did I know that some 15 years later I would come to live in there. My sister Rosabella had taken me to visit a friend who lived in Charles Hocking House. Rosabella had told me of some 'great fun' that was going on where her 'friend over the bridge lived'. The video that's been shown further down in this blog, which is called 'Adventure Playground' shows Barrie House under construction, so I'm fairly certain that the 'great fun' was in the adventure playground. I don't recall making a mark on the walls shown in the video, but it certainly looks like the kids had lots of creative fun painting on them. Over the years I've written a few about life in Acton. In 1986 I'd forwarded one of my poems to the local councillor for Heathfield ward, who suggested I popped into the Oak Tree Community Centre and I did. This is where I met Martin Frost who was the manager of the centre. It might have been like a magical 'hand' had just walked through the door, as Martin had been hoping to get a Summer project set up for the kids on the estate. The small oak tree image after the poem leads to a page in this site about that mural project. It's great to see that over time that art has been a significant factor within the Acton community. 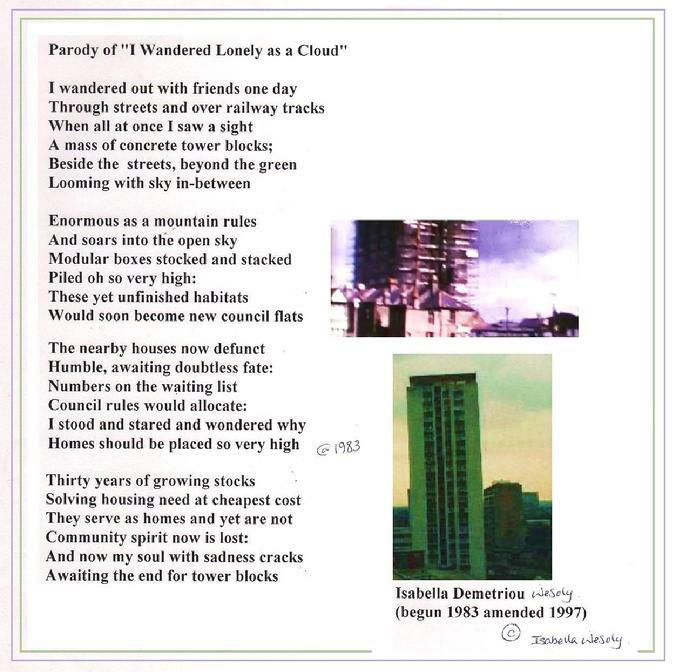 The last few lines of the poem about Barrie House and the tower block estate were written 14 years after moving away from South Acton, it was a peculiar reflection on what attempted to solve the post-1940's housing crisis. West 3 Gallery in High Street, Acton is becoming a favourite spot for me to visit. It's great to see that in spite of the current economic issues we are faced with (on local, regional and global levels), that creative activities are supported. 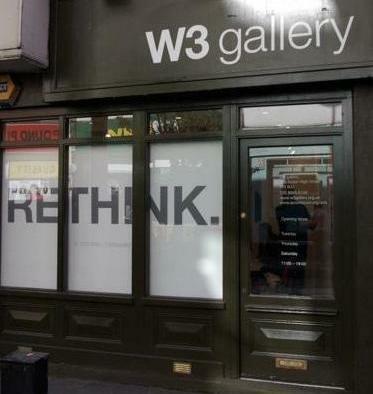 The official name for the gallery in Acton is W3 Gallery, but some people may use the word 'west' in a search engine. Therefore I use both intermittently on this site, as well as West Three, a wide net is IS. I would like to thank Cecile for keeping me up-to-date with the arts in Acton and W3 Gallery. Another celebration from the past, shared with me today. The film footage was taken in Churchfield Road, Acton High Street and nearby areas. Today we reflected on the changes that have taken place over the years. There are no red telephone boxes in Acton now, where did they all go I wonder? There were 14 minutes before the E3 bus was due today, when I stepped out with my 3rd daughter (Marcella Rose) for a trip into Acton Hill. I had a reasonable bet with myself that we could cover most of the distance before the bus came. So we walked through Gunnersbury Park, getting a clear and open view of Brentford, Chiswick and Acton skylines ahead. We'd got as far as what used to be 'The Broadway' Greek restaurant before the bus came along, but we were warm from the walk and defintely in Acton! A weave in and out at Acton Town station/Bollo Lane zebra crossing towards the Mill Hill Tavern landmark (across from the old Passmore Edwards Cottage Hospital) then right, onwards and upwards to Acton High Street. It was a good day to walk back, Eastwards from Windermere Road. We had a warm welcome from volunteers 'of 'We Love Acton' group, who were running a tombola stand and was one of many stalls set up to bring the spirit of 'Christmas' into Acton. It was great to see the 'We Love Acton' regular photographer David Lawes, as felt like my wishes for an assistant had landed square in front of me when I saw him! Many thanks to David* for co-operating with me on this quest for Acton. *The photographs on this blog, or linking to today's events are courtesy of David Lawes, with permissions. As we crossed over the A-4020 Uxbridge Road, friendly forces brought a smile to Marcella, me too! This was a welcome site to the right of the 'We Love Acton' community stall, where St. Mungo volunteers spread the good news about helping rough sleepers. St. Mungo's mainly cover the London area, but check out their website for more information. It's well worth sharing with someone that has no place to go this Christmas. Set up in 1969 by a Glaswegian in Battersea, London. If you see anyone sleeping rough in Acton, London or in your locality please contact St. Mungo's. Help is out there for rough sleepers. 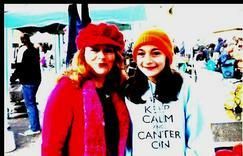 The orange hats on St. Mungo's tables caught our eyes from a distance, Marcella loved hers! sometimes somehing might be missing, if you notice please call me to let me know. Last week my blog covered a little of what's been going on in the town of Acton, London W3. One blog about Acton can never be enough (in my opinion), especially now that a social networking / fundraising group has developed in its name. 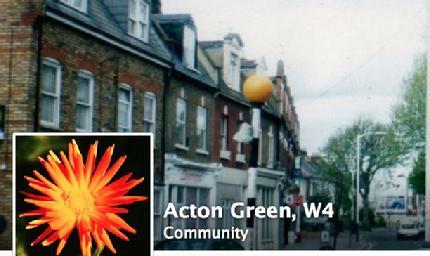 The Facebook group called 'We Love Acton' arose from what was initially intended as a bit of 'fun', in May 2012. But I'm sure that many people are in gratitude to Mike Baxter who founded the group, as well as Antoinette Smith for managing the 'We Love Acton' group's events and online space pages. With a current membership reaching across the world, with a count of 2437 (as of 15/12/2012), there's clear evidence that Acton is becoming a more global and dedicated community. or indeed a response to the request 'Please Love Acton'. WLA does! I'm sure that as time/space allow I'll be blogging on 'Love Acton'. 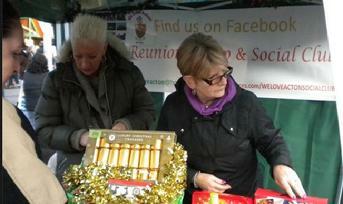 Both are a positive sign that community efforts work, as witnessed at Acton Market Christmas Fair on 8th December 2012.